I’ve been excited to make these peppers for a while now, so I took advantage of my sudden burst of energy and decided to finally give it a try. I used flavored couscous and Italian veggie sausages to make it easy, and even used baking time to do the dishes AND a load of laundry. That means I don’t have to be productive for the rest of the week, right? By the way, I apologize for the bad pictures – I was hungry and impatient! The first thing you want to do is preheat your oven to 400 degrees. While your oven is preheating, get the couscous started (according to package directions) and then start chopping up your veggie sausages. I used a mix of lighter sausages, and some with a little more fat and flavor. 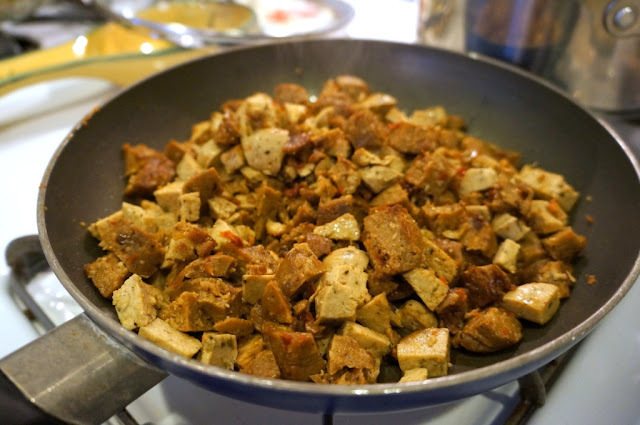 I’ve found that chopping them up works pretty well – I don’t like big chunks of them in my food, and they don’t really crumble the way real sausages do, so it’s the best of both worlds. Once your sausages are chopped up, add them to a nonstick skillet over medium-high heat with a tablespoon of olive oil. I’ve been using light olive oil lately and find that it does a better job of browning, but whatever kind you have will be fine. Stir the sausages occasionally, and cover with a lid – this helps to keep the moisture in. While your sausages are browning, prepare your bell peppers. I used a mix of green and red; the green ones had flat bottoms, so I simply cut the top off and pulled out the seeds and…gills? (I have no idea what the thin part inside is called). For the red peppers, I cut them in half long ways. When your sausages are browned, add them to the couscous and mix well. (Make sure not to overcook the sausages!) 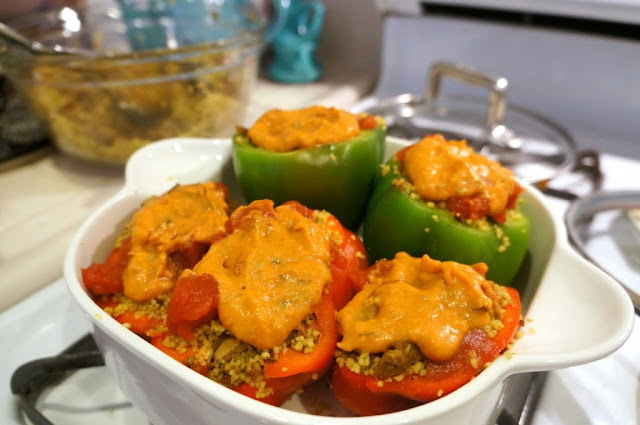 Then, simply fill each of your peppers with a good amount of filling, and top them off with about a tablespoon each of diced tomatoes and creamy marinara. You can be a little more liberal here if you want to. Place them in the oven for approximately 40 min, then pull them out, add the mozzarella right on top, and pop them back in the oven until the cheese is melted and bubbly. If you use reduced fat cheese, don’t leave it in as long. And that’s it! I was worried that they might be a little dry, but I actually really liked how they turned out. 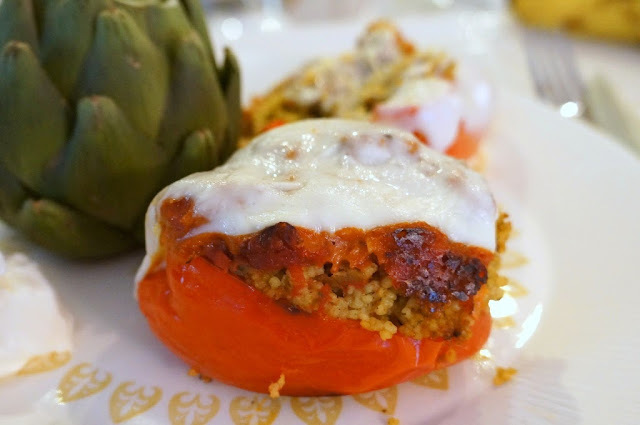 I’ve had pre-made stuffed peppers before and they are always a little too juicy/runny for my taste, so I thought these turned out perfect. 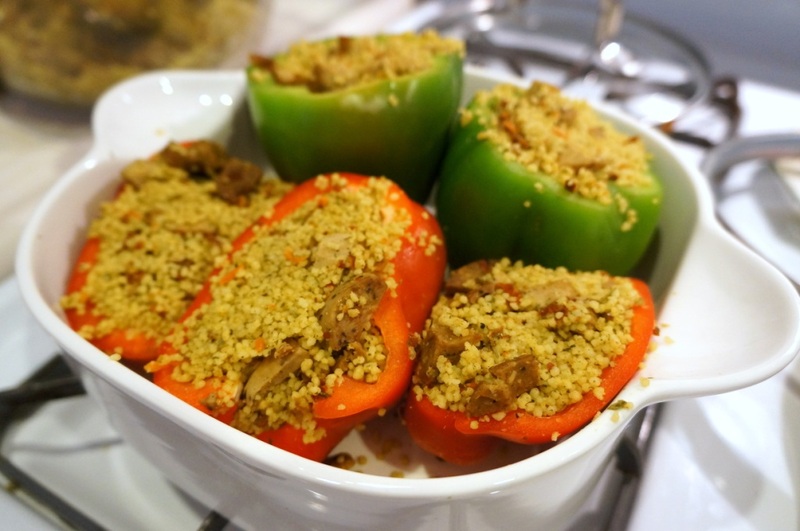 If you like yours a little juicier, feel free to mix your desired amount of sauce into the couscous/sausage mix before filling the peppers, and then add a little bit extra on top to keep it moist. 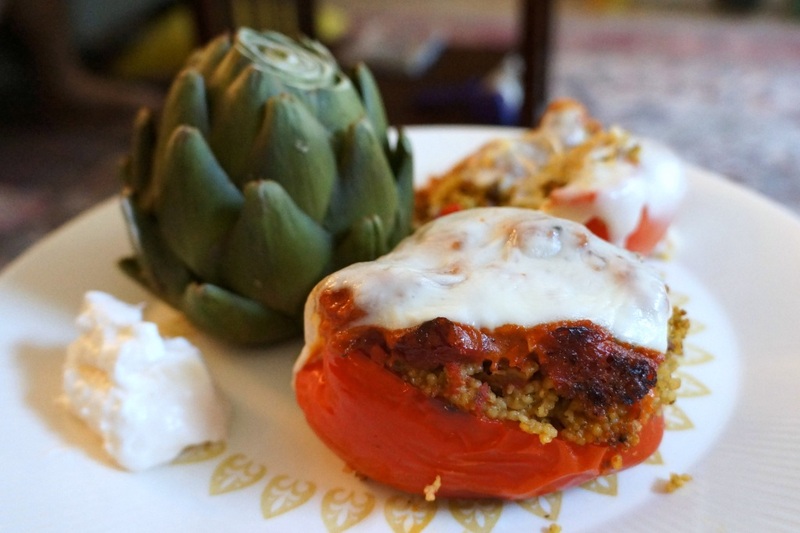 I served these with steamed artichokes (one of my faves! ), but asparagus, green beans, and kale all came to mind as well. They are pretty much a full meal by themselves, so they don’t need much to go along with. Soup or salad would also be good combos. I hope you enjoy these, and let me know what you think!